Fishing Lake-Fireplace-Hot Tub-Large New Deck-Free WiFi-Close to Everything! Looking for something special and not a cookie cutter rental? Scroll down and read our reviews and discover what others are saying about this newly-remodeled, pet friendly rental. 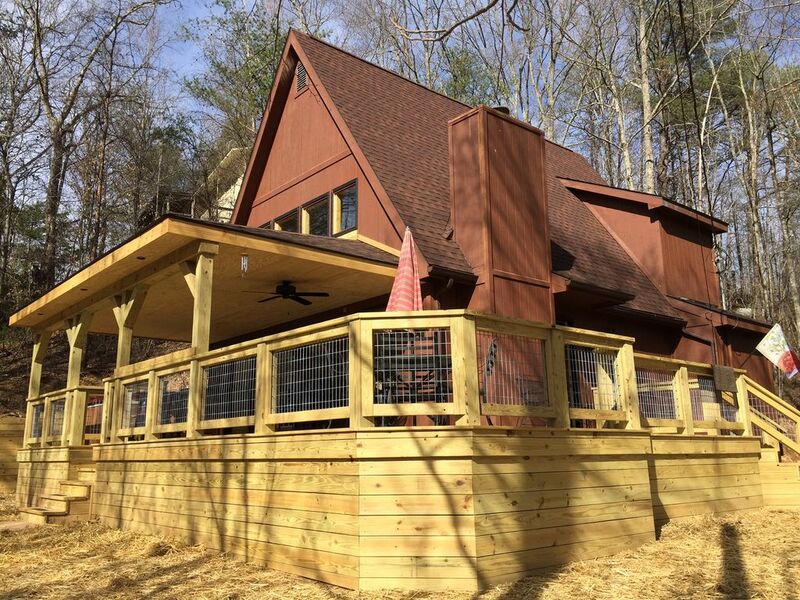 This cabin lives like your own home--comfortable, clean and convenient to everything in Pigeon Forge and Gatlinburg. Only 5 minutes to either town. And you're right around the corner from a 6 acre community lake, so it's great for taking family walks, exercising the dog or catch-and-release fishing. Swaying Pines is now in it's 16th year as a vacation rental cabin and we continue to make improvements every year. Come discover what our past guests are talking about! * WALK-IN SHOWER on first floor; KING LOG BED in master bedroom; STORAGE bookshelves by kitchen. The new deck is 50% larger than the original and features dining table seating for 6 plus 3 bar stools. The hot tub electronics have been replaced and updated as of February 2016. Swaying Pines has 2 bedrooms and an open loft for sleeping quarters. The first floor bedroom features a king log bed while the upper bedroom has a queen size log bed. The loft has a double bed. We have also added a twin pullout bed in the living room. The ottoman converts in less than 30 seconds to a bed that will comfortably sleep a child or teenager. Swaying Pines's location is right between Pigeon Forge and Gatlinburg--only a few minutes' drive to either town. Well-paved roads with no scary mountain drop-offs or challenging curves. Just a steady climb that most vehicles can easily manage. Thank you for considering our pet friendly cabins. Even if you don't bring a dog along--and most of our guests don't--we pride ourselves in maintaining a fresh, clean cabin that you'll never know is pet friendly! Pet stays are a separate fee and must be approved in advance. Hi I'm Amy Greener and along with my husband Rick, we own and self-manage our 6 cabins in Pigeon Forge and Gatlinburg. Our goal is to give you the best vacation rental experience ever. We hope to retire someday but for now, this is our family business and it keeps us busy! We would love to be your hosts at Swaying Pines. Lots of people ask us why we chose this area to buy a vacation rental, when there are so many beautiful properties in our home state of Michigan. Honestly, it boiled down to two big factors: money and weather. With three young children, we didn't have much money to work with. We were looking specifically for a modest, fixer-upper. And Michigan gets mighty cold after October, so we headed south for our cabin search. We love the Smokies, the history of the area and it's welcoming people. We've made many friends and acquaintances there over the years, and you can't help but feel that wonderful southern charm and hospitality wherever you go. The fishing lake is just around the corner from the cabin. You can only see the lake from the edge of the property where the cedar swing is located. One bath towel and wash cloth per guest. One hand towel per bathroom. We also provide make-up washcloths in each bathroom (black). Well-outfitted with quality cookware, bakeware and utensils. Approximately 80 DVD movies for all ages--from classics to Academy award winners! The home was absolutely perfect for our family get together. The deck was the hottest feature for us, we spent hours out there a day. The whole house was beautiful. I believe the only downside were the beds. The one in the loft area really fits two children, not two adults over 5 foot tall. But, other than that, loved every minute of it! This cabin is perfect, stocked with anything you will need, comfortable beds, reliable internet and cable, a great wrap around porch, hot tub, clean, cooking supplies, spices, cooking spray, all kinds of extras. We came to get married and were able to bring our puppies, just a great experience. There was plenty of room for 2 vehicles to park, we will definitely be back! Five star rating. Very nice cabin. Awesome location. Will most likely make a return visit in the future. Best Rental in The Smokey Mountains!! We had a wonderful time staying at Swaying Pines. Has everything you need, and more. It's like coming home as soon as you walk in the door. Highly, highly, recommend this home-away-from-home! There's a lake just a short 2-minute walk away, perfect for fishing or just taking a leisurely stroll. So peaceful and quiet. It's so convenient to everything. And it's less than a mile off the Spur. Can't get back here soon enough. Absolutely love it! Thank you for the recommendation to others! We appreciate that more than you know :) Please come again anytime. Absolutely loved our stay at the cabin. The cabin was very inviting and felt like home. Plenty of room, yet very cozy. Amy was great to work with and very nice. You're minutes from Pigeon Forge and Gatlinburg and all the hustle and bustle, or you can relax by the fire at the cabin, either way you can't go wrong. I got to sit in a hot tub while it snowed for the first time and that was great experience in itself. The lake and walking trail around the lake are beautiful and I could spend a day there. Would definitely stay at this cabin again. Thank you, Richard! I agree, it’s so neat to be in a 100 degree hot tub and snow is swirling around. It’s surprisingly comfortable and refreshing lol. Thank you for all the kind words and compliments. We love to know our guests had a great experience! Please come again. We enjoyed our stay here! The beds were so comfortable, and we had everything we needed to have a lovely weekend! Thank you, Allison. I'm glad you had a great time. Hope to have you back again for a longer stay in the future! Cancelled reservations with 60 days or less notice are not refundable. TRIP INSURANCE available through Homeaway is strongly recommended for full protection of your vacation investment. Pet stays are $95/dog plus tax. Pets must be adult dogs, house-trained and current on flea/tick medication. Dogs up to 100 pounds may be considered and must be approved in advance. Prior to accepting your reservation, we will need your pet's name, age, breed and weight.